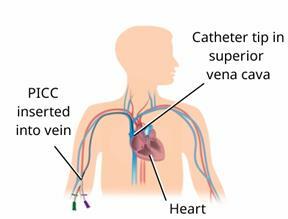 A peripherally inserted central catheter (PICC) is a form of IV access that allows medicines and IV fluids to be quickly distributed throughout the body. The PICC is a long, thin, flexible tube (catheter) that is inserted into a vein in the upper arm. The catheter ends in a large vein in the chest (superior vena cava, or SVC). After the PICC is inserted, a chest X-ray may be done to make sure that it is in the correct place. To give medicines and liquid nutrition. To give IV fluids and blood products. If there is trouble placing a peripheral intravenous (PIV) catheter. If taken care of properly, a PICC can remain in place for several months. Having a PICC can also allow a person to go home from the hospital sooner. Medicine and PICC care can be managed at home by a family member, caregiver, or home health care team. A blood clot (thrombus) forming in or at the tip of the PICC. A blood clot forming in a vein (deep vein thrombosis) or traveling to the lung (pulmonary embolism). Inflammation of the vein (phlebitis) in which the PICC is placed. Infection. Central line associated blood stream infection (CLABSI) is a serious infection that often requires hospitalization. PICC movement (malposition). The PICC tip may move from its original position due to excessive physical activity, forceful coughing, sneezing, or vomiting. A break or cut in the PICC. It is important not to use scissors near the PICC. Nerve or tendon irritation or injury during PICC insertion. Before touching the PICC line or the infusion device. Before changing a bandage (dressing). Flush the PICC as told by your health care provider. Let your health care provider know right away if the PICC is hard to flush or does not flush. Do not use force to flush the PICC. Do not use a syringe that is less than 10 mL to flush the PICC. Avoid blood pressure checks on the arm in which the PICC is placed. Never pull or tug on the PICC. Do not take the PICC out yourself. Only a trained clinical professional should remove the PICC. Use clean and sterile supplies only. Keep the supplies in a dry place. Do not reuse needles, syringes, or any other supplies. Doing that can lead to infection. Keep pets and children away from your PICC line. Pus or a bad smell. Keep your PICC bandage (dressing) clean and dry to prevent infection. Ask your health care provider to teach you how to wrap the PICC line. Cover the PICC line with clear plastic wrap and tape to keep it dry while showering. Wash your hands with soap and water before you change your bandage (dressing). If soap and water are not available, use hand sanitizer. Change your dressing as told by your health care provider. Leave stitches (sutures), skin glue, or adhesive strips in place. These skin closures may need to stay in place for 2 weeks or longer. If adhesive strip edges start to loosen and curl up, you may trim the loose edges. Do not remove adhesive strips completely unless your health care provider tells you to do that. Change your PICC dressing if it becomes loose or wet. 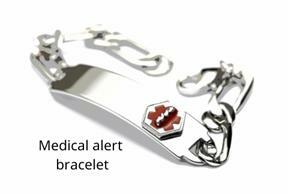 Carry your PICC identification card or wear a medical alert bracelet at all times. Keep the tube clamped at all times, unless it is being used. Carry a smooth-edge clamp with you at all times to place on the tube if it breaks. Do not use scissors or sharp objects near the tube. You may bend your arm and move it freely. If your PICC is near or at the bend of your elbow, avoid activity with repeated motion at the elbow. Avoid lifting heavy objects as told by your health care provider. Throw away any syringes in a disposal container that is meant for sharp items (sharps container). You can buy a sharps container from a pharmacy, or you can make one by using an empty hard plastic bottle with a cover. Place any used dressings or infusion bags into a plastic bag. Throw that bag in the trash. You have pain in your arm, ear, face, or teeth. You have redness, swelling, or pain around the insertion site. You have fluid or blood coming from the insertion site. Your insertion site feels warm to the touch. You have pus or a bad smell coming from the insertion site. Your skin feels hard and raised around the insertion site. Your PICC is accidentally pulled all the way out. If this happens, cover the insertion site with a bandage or gauze dressing. Do not throw the PICC away. Your health care provider will need to check it. Your PICC was tugged or pulled and has partially come out. Do not push the PICC back in. You cannot flush the PICC, it is hard to flush, or the PICC leaks around the insertion site when it is flushed. You hear a "flushing" sound when the PICC is flushed. You feel your heart racing or skipping beats. There is a hole or tear in the PICC. You have swelling in the arm in which the PICC was inserted. You have a red streak going up your arm from where the PICC was inserted. A peripherally inserted central catheter (PICC) is a long, thin, flexible tube (catheter) that is inserted into a vein in the upper arm. The PICC is inserted using a sterile technique by a specially trained nurse or physician. Only a trained clinical professional should remove it. Keep your PICC identification card with you at all times. If cared for properly, a PICC can remain in place for several months. Having a PICC can also allow a person to go home from the hospital sooner. This information is not intended to replace advice given to you by your health care provider. Make sure you discuss any questions you have with your health care provider. Elsevier Interactive Patient Education © 2019 Elsevier Inc.